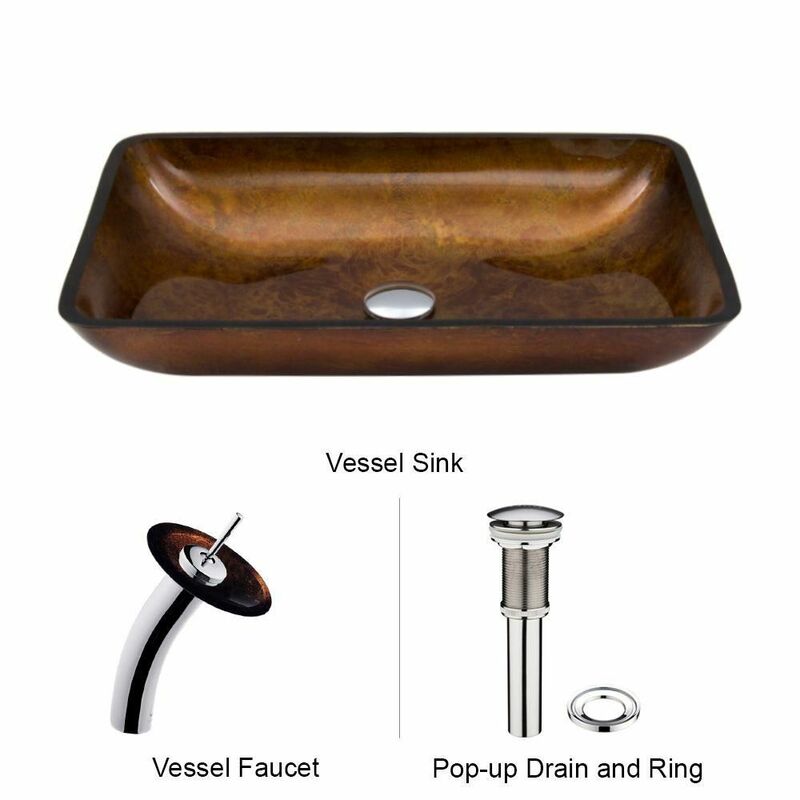 Glass Vessel Sink in Rectangular Russet with Waterfall Faucet in Chrome is rated 4.9 out of 5 by 15. Rated 5 out of 5 by Judy 24 from It is amazing. I love it. I bought it and when I opened it I was surprised it was nicer than I thought it would be. It looks great and everyone who sees it wants one too. The only problem is that the installer put the faucet too close to the drain and it splashes when the water is on full force. It completed our new Bathroom. Rated 5 out of 5 by Frongi from Awesome Vigo Rectangular I bought this at the beginning of Feb 2016 and have thoroughly enjoyed its design, functionality, style and color. Rated 5 out of 5 by yessipal from Good product Product looks great and works well. I would definitely recommend. Rated 5 out of 5 by yessipal from Stunning! This sink and faucet is beautiful and impressive. The colors are much deeper and more vivid than shown in the pictures. It works beautifully. We bought two sets and would definitely buy again! Rated 5 out of 5 by SandyA from Love It Our new sink just arrived and we are thrilled with it. It looks even better than we anticipated. Having purchased and installed another vessel sink a few weeks ago, we know how easy the installation will be. Beautiful addition to any bathroom. Rated 5 out of 5 by KrystynaM from Absolutely Gorgeous! This sink and faucet by far exceed my expectations! The color is beautiful and the sink is quality.